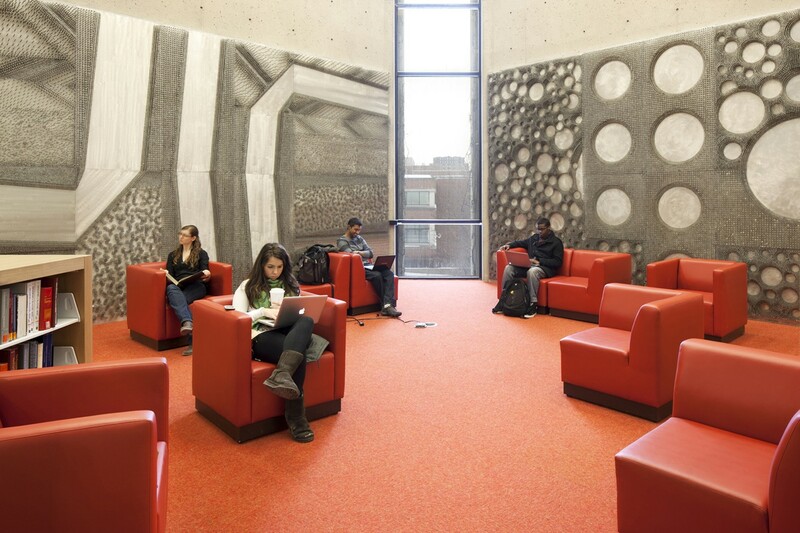 The Scott Library at York University is a monumental concrete building, built in the late 1960’s that reflects the social and political spirit of its time period. 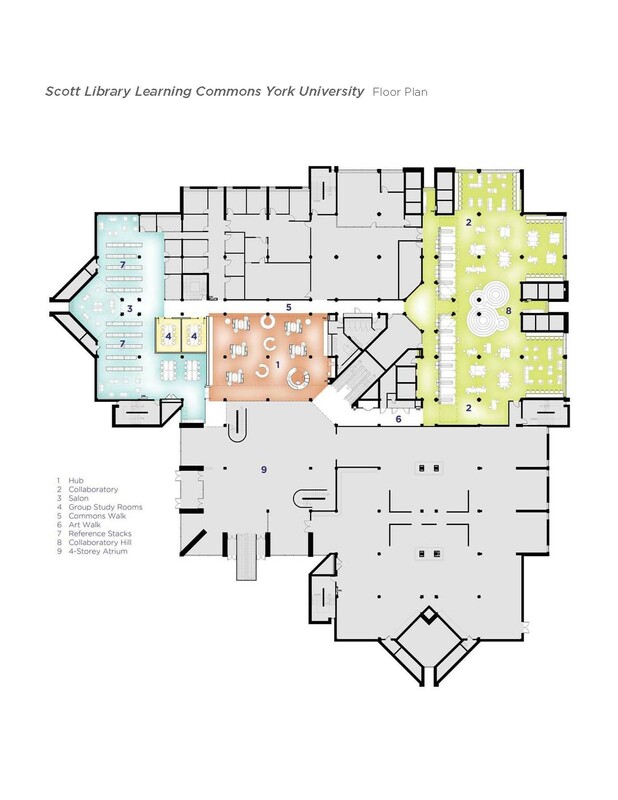 In order to meet the current needs of the university, York required the interior of this building to be more welcoming, better suited to its diverse student population, and to an evolved ethos of relaxed, self-initiated and collaborative learning methodology. 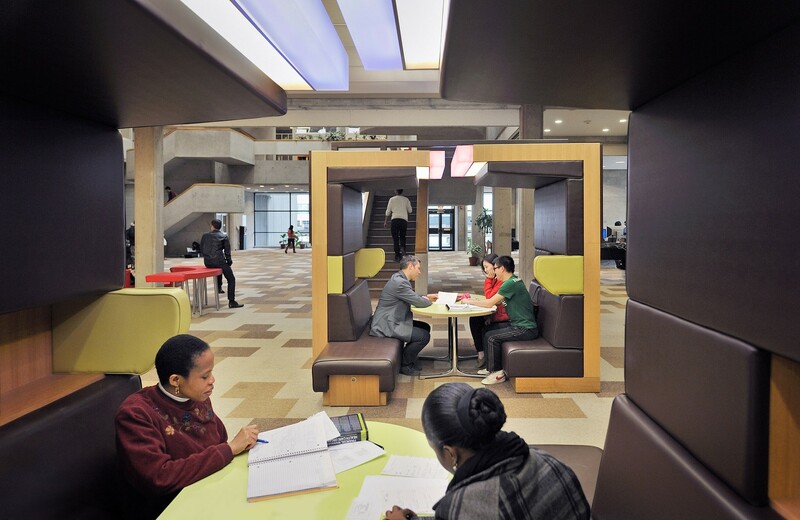 In response, we established a Learning Commons on the main floor with a variety of study and tutorial spaces. 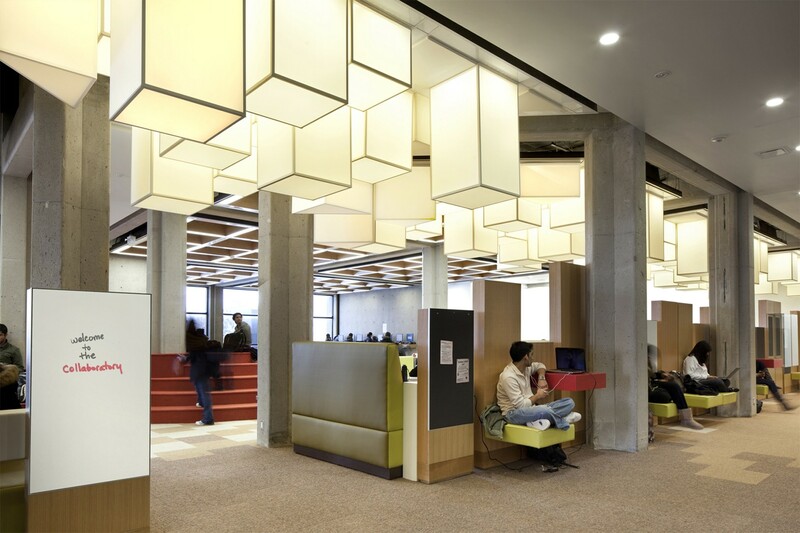 Focusing on modifying the interior atmosphere rather than the architectural structure, our concept grew from custom-designed, hybrid interior/furnishing elements, that prompt various informal, socialized study experiences. 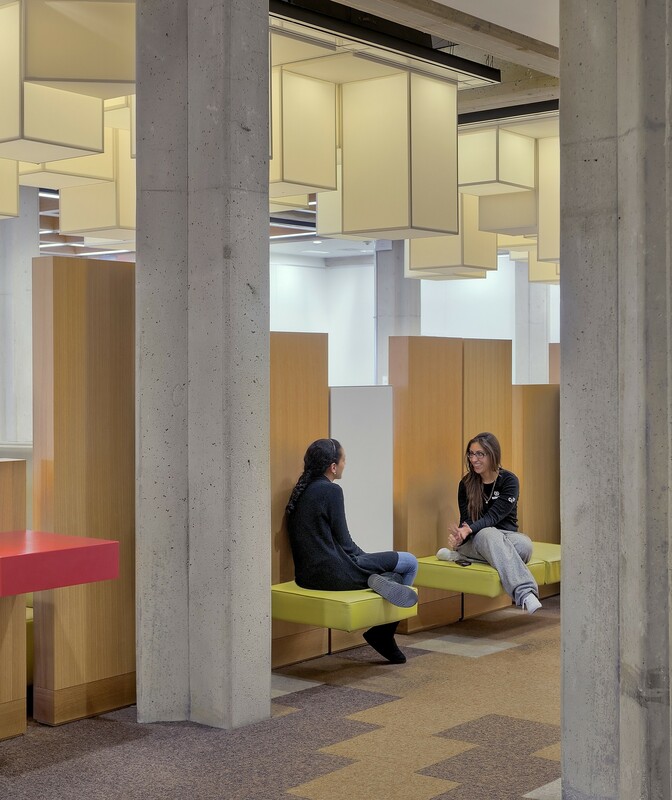 Their bold colours and simple geometries defuse the somewhat imposing environment, creating an entirely new scale and branding for the library that is fresh, modern, and relaxed; like the students themselves. This ensured that the project was more efficient and cost-effective than full-scale construction and it can be easily modified, so that it is sustainable for York’s current and future needs. 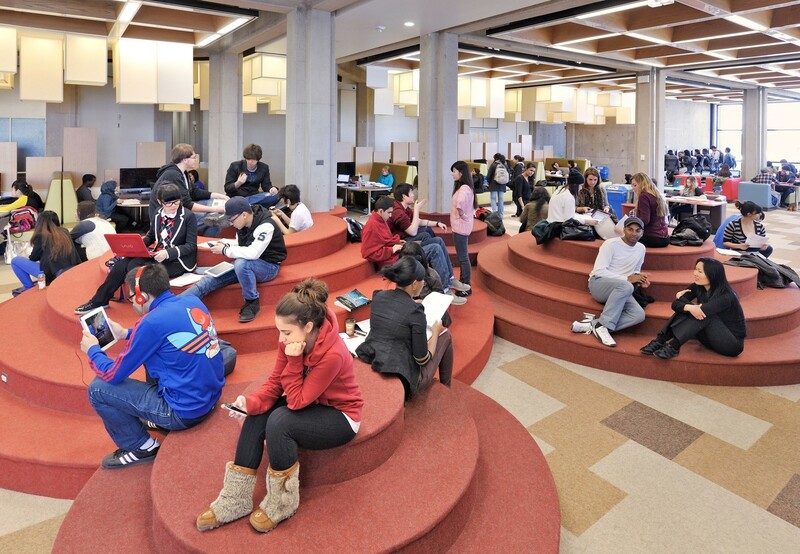 Whether students prefer to learn alone or in a group; at a desk, in an armchair, on the floor; in an open area or an enclosed room; with bright daylight or soft-lighting conditions; with noise or quiet, the Learning Commons offers a variety of comfortable places to hang out and its flexibility accommodates a shifting campus culture and a diverse program of services and events. Highly visible from the main circulation path, library users are first greeted by the bold ‘Information Kiosk’ crowned by circular swirling digital announcements. There, students can seek help and book time with academic support specialists. 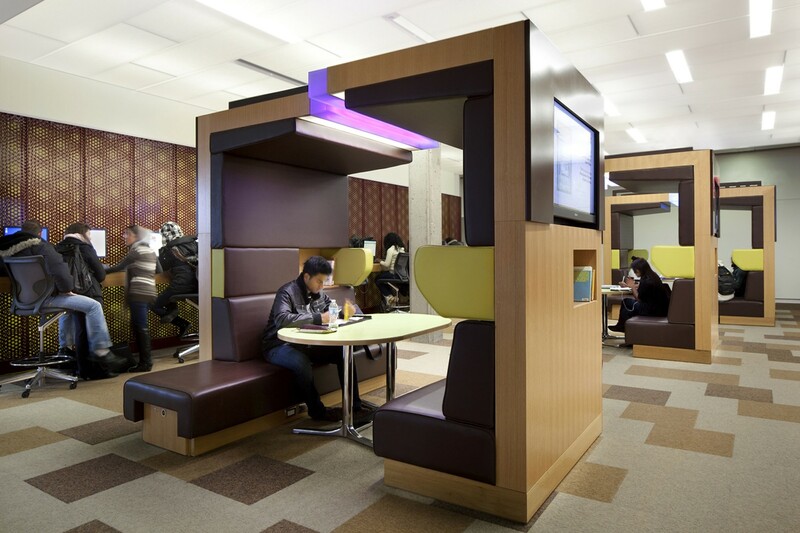 The kiosk edges ‘The Hub’ an area populated by ‘Learning Pods’ – highly functional, easily reconfigured furnishings designed for counseling and workshops. They are intriguing pavilions in the library landscape with upholstered seating, built-in power sources, monitors and shelving. Users can adapt the pods as desired by changing their video monitor walls for signage, presentation boards, and even art exhibitions. The pods’ popularity relies on their appropriate mix of extroverted and introverted qualities. For example they offer simultaneous semi-privacy and external visibility and their protruding benches snag visitors, while their interior acoustics are surprisingly muted. 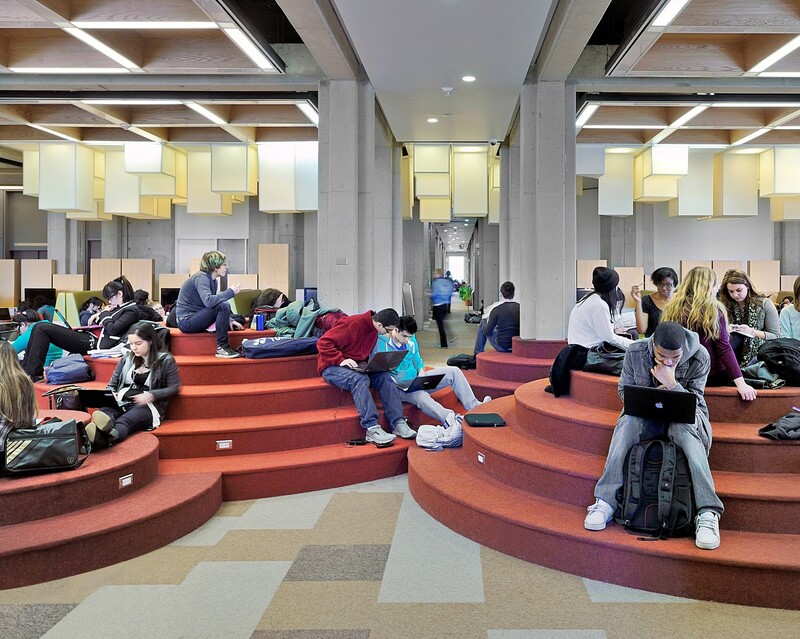 In the neighbouring ‘Collaboratory’, a playful landscape of circular red steps called ‘The Hill’ invites students to spread out on the floor close to power outlets where they can plug in laptops, phones and music. 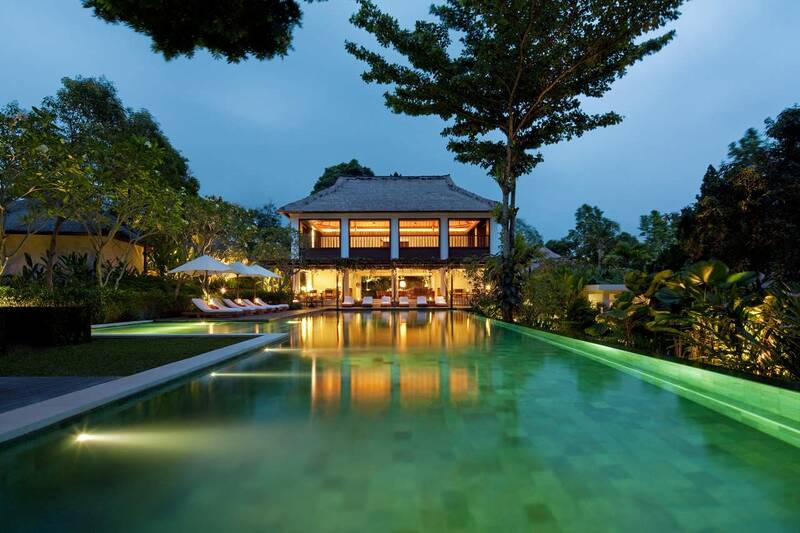 These steps can also be used like an amphitheatre for speakers or presentations. The room is also furnished with free floating tables – light enough to be moved about at will, and built-in booths that terminate with centralized monitors for group presentations, surfing or teleconferencing. 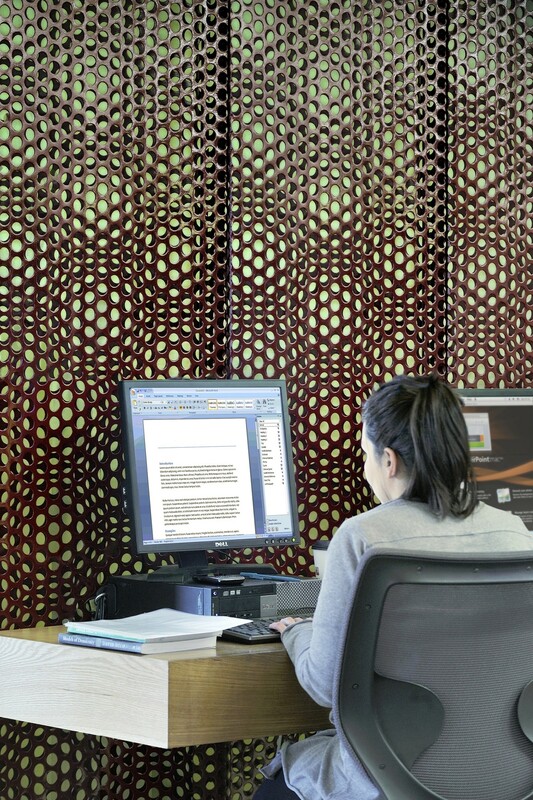 On the flip side of the monitors’ partition wall, individuals can perch at more secluded desks with power from the same sources. In ‘The Salon’ students can cozy up in large armchairs and study in a quiet environment. For those who need a completely segregated meeting place there are group study rooms. 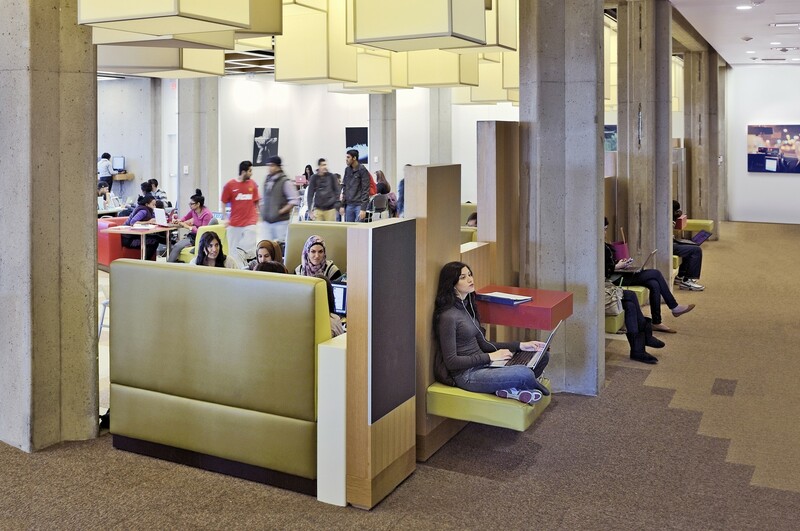 The Learning Commons is now lively with both dynamic, open, social spaces and more intimate, private working areas. 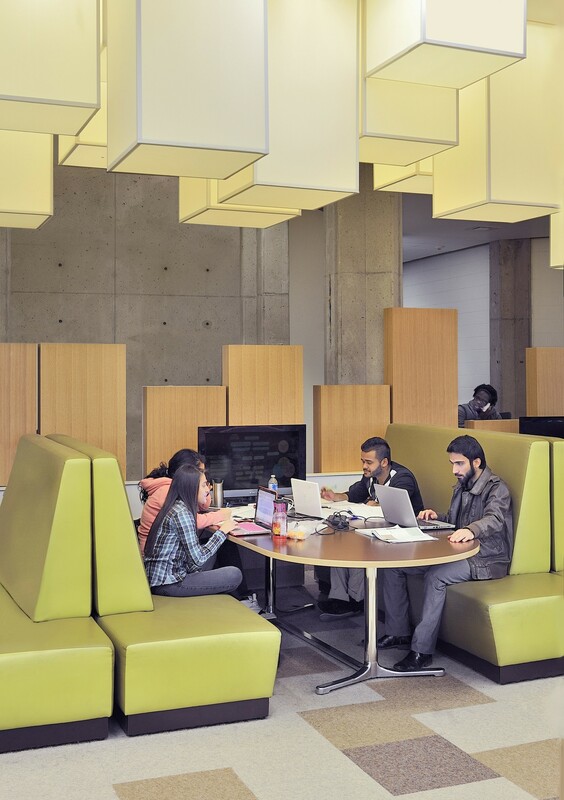 Students have appropriated their favourite work spaces and developed a sense of ownership of the environment that fosters collaboration, interaction and pride. 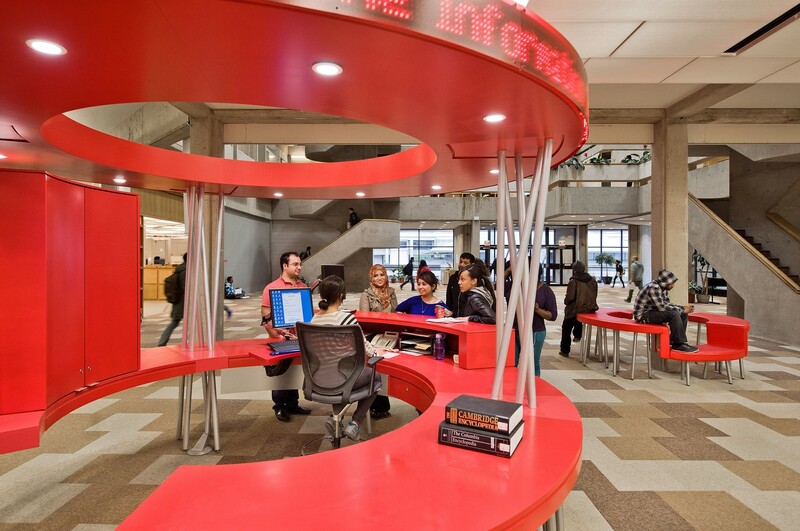 Now that services are accessed from The Hub, students have an easier time navigating the library. 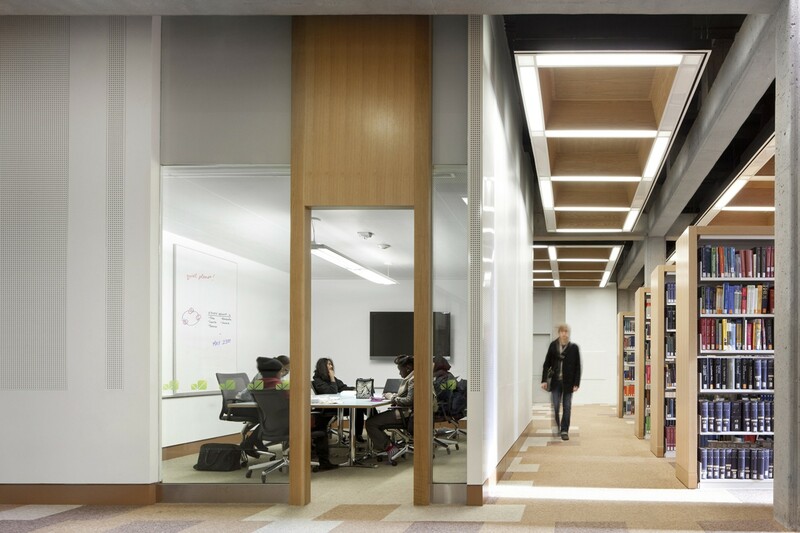 The investment reinvents and reinvigorates the library, embodies York University’s diversity and pedagogical shift to social learning and establishes the Learning Commons as a major public space on campus. Photographs: Bob Gundu, Ben Rahn © A-Frame Inc.